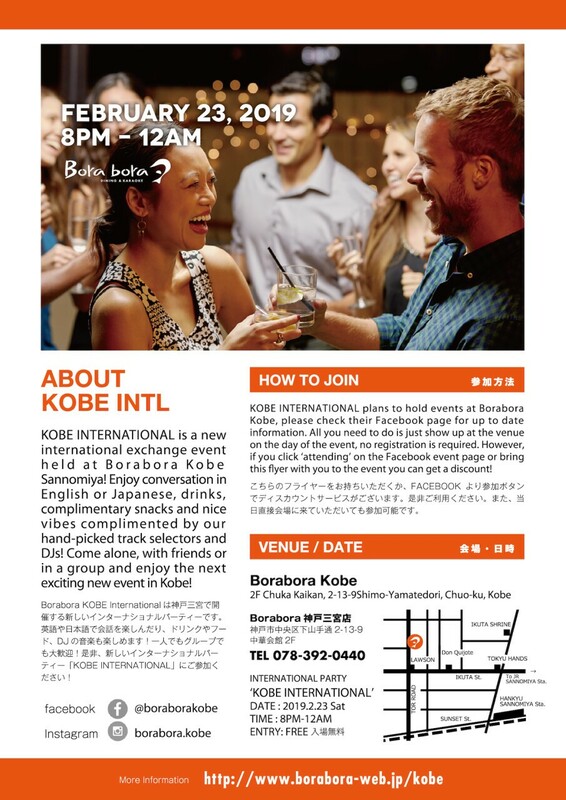 KOBE INTERNATIONAL is a new international exchange event held at Borabora Kobe Sannomiya! Enjoy conversation in English or Japanese, drinks, complimentary snacks and nice vibes complimented by our hand-picked track selectors and DJs! Come alone, with friends or in a group and enjoy the next exciting new event in Kobe! Borabora KOBE International は神戸三宮で開 催する新しいインターナショナルパーティーです。 英語や日本語で会話を楽しんだり、ドリンクやフー ド、DJ の音楽も楽しめます!一人でもグループでも大歓迎!是非、新しいインターナショナルパーティー「KOBE INTERNATIONAL」にご参加ください! A NEW international party that can only be thrown by us at BORABORA KOBE! An event to exchange ideas and languages, supplemented by music, food and atmosphere! Perfect for those who want to make international and local friends, practice their language skills or just enjoy some GOOD MUSIC and GOOD FOOD! ・The unlimited drinks menu is of course packed to the brim featuring beer, wine, shochu, sake, whiskey, liqueur, cocktails and soft drinks! ・Enjoy snacking on free FINGER FOOD throughout the night! For those who are coming extra hungry, we'll also have a special event menu also on hand! ・We will be handing out 1 free drink ticket per person to those who click 'attending' on this Facebook event page! Please show it to staff on-site to claim your ticket.